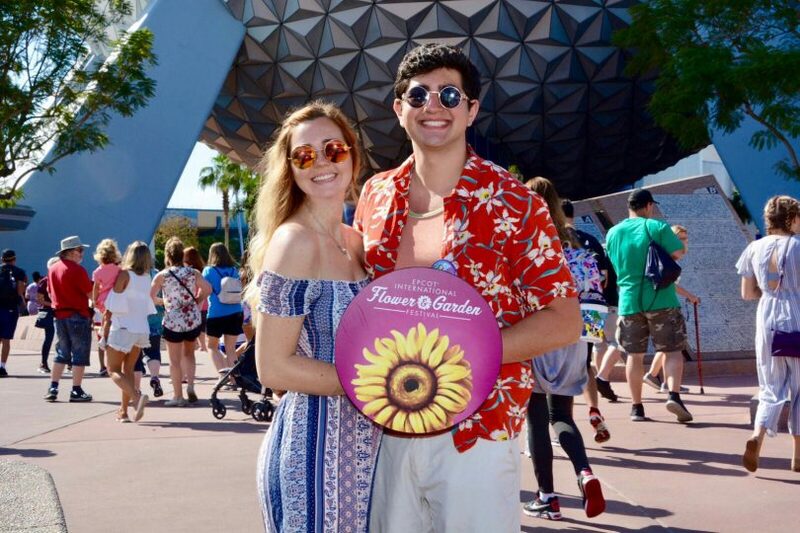 ORLANDO, Fla. — In a Facebook post gone viral, Boston University graduate Brittany Blake enlisted the help of the “Annual Passholders – Walt Disney World Resort” Facebook group in March after she lost her boyfriend in Epcot. “Weird post but lost my boyfriend in Epcot today and haven’t been able to find him for hours because his phone is dead. If anyone sees him can they tell him to meet us in the Mexican pavilion?” Blake stated in the Facebook post. The story of Blake losing her boyfriend, named by several news outlets as Regory Turco, was reported first by ABC Action News, followed by Fox News, People, and Travel and Leisure, and more. The problem? Turco’s first name is Gregory, not Regory. Blake said Andrea Lyon, an ABC Action News reporter, was a member of the Facebook group where Blake posted about losing Turco. When Blake was contacted by Lyon about publishing the story, Lyon never asked to clarify if the name Turco uses on Facebook was his real name, Blake said. After the first story was published by ABC Action News, all the news outlets that reached out to Blake regarding the story never questioned the spelling of Turco’s name before publishing their own stories, Blake said. Like many millennials, Turco said he uses a fake name on Facebook, as well as other social media platforms, to steer clear of possible employers searching for him on his accounts. “[Andrea Lyon] got the name from Facebook, she was the first one to spread the news. That was my name on Facebook so that companies I worked for couldn’t find me. I didn’t want to risk getting fired or in trouble for social media,” Turco said. Turco has had the unique experience of unintentionally going viral while still remaining somewhat anonymous. Turco said, it wasn’t until a week after the first story was published that any news outlet asked him about the spelling of his name. At that point, he decided to stick with Regory. “Once this all blows over I’ll probably change my name on Facebook again,” Turco said. 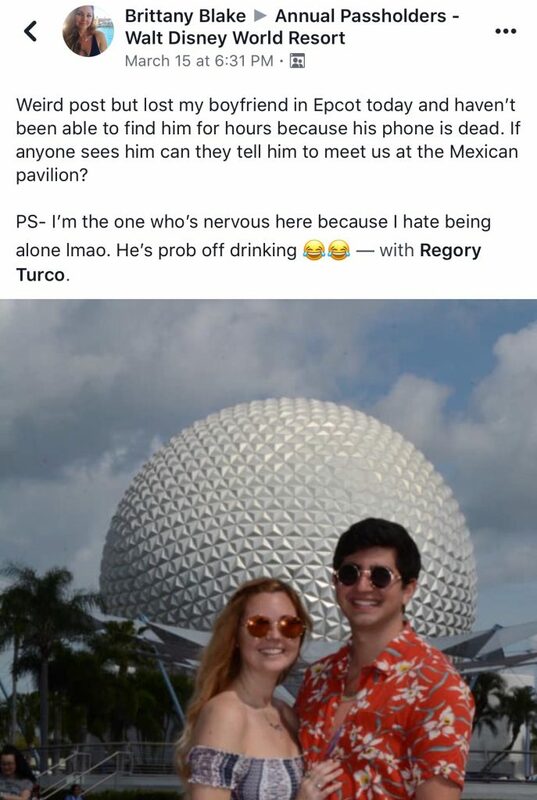 Even though his girlfriend’s Facebook post caught the attention of both the media and the public, the bizarre story of why Turco, a 29-year-old man, went missing in Disney World is still unclear from the stories that have been published about his ordeal. Turco said he had been separated from Blake for six hours, not the reported three. This happened when Blake stepped out of the aquarium near the Nemo ride, and Turco couldn’t find or contact her because his phone battery was close to dying, he said. 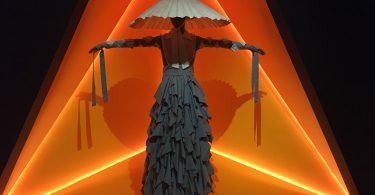 He did however, see two friends that had been meeting up with the pair throughout the vacation who mistakenly told Turco that Blake was in the China area of Epcot. Unbeknownst to them, Blake was still waiting near the aquarium ride. Blake said she was contacted by one of the friends to meet up with them and Turco in China, but the friends failed to mention that Turco was in the bathroom, and the three of them left without Turco. “They told me they were in China so I found them, but Greg was in the bathroom. They told them they’d wait on him but forgot and left with me,” Blake said. When Turco left the bathroom and noticed no one was there, he turned on his phone one last time in an effort to save the battery and got a text from Blake saying that she was headed to another ride without him. “From my point of view, they had left me and gone on the the Soarin’ ride, so I said screw it, I’ll do the rest of the day on my own,” Turco said. Turco spent his six hours of freedom going on every ride at Epcot with his fast-pass and eating at several food stands. He said he had no idea how worried his girlfriend was because his phone’s battery had died, and was completely unaware that Blake made the Facebook post two hours into their separation. Blake said she first went to the hotel they were staying in to see if he was there, and then decided to reach out to park security, who told her they would not be able to help her find her boyfriend as he was not a minor and it could be considered a breach of Turco’s privacy. “The Facebook post was my last option because I had already walked around the park and went back to the hotel. I even asked security but they said they couldn’t do anything to help. When I made the post I was thinking that it was a silly post and people would just look right over it, but I still had the hope that someone would be able to find him for me,” Blake said. 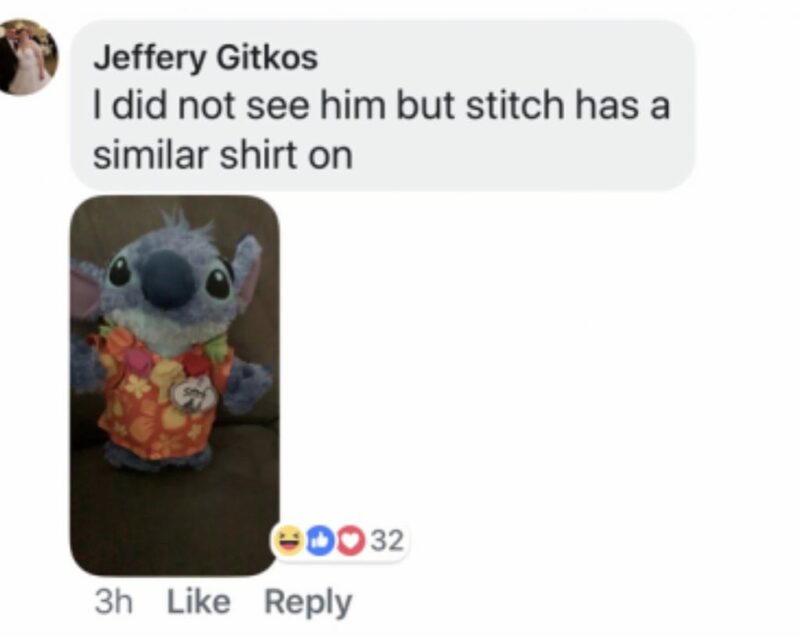 Fellow members of the Facebook group initially showed support for Blake and were concerned for Turco’s whereabouts, but as time went on, the comment section of the post became a Regory “roasting” platform, with photoshopped pictures of Turco appearing to be in different parts of the park, and his shirt being compared to what a stuffed animal of the character Stitch was wearing. 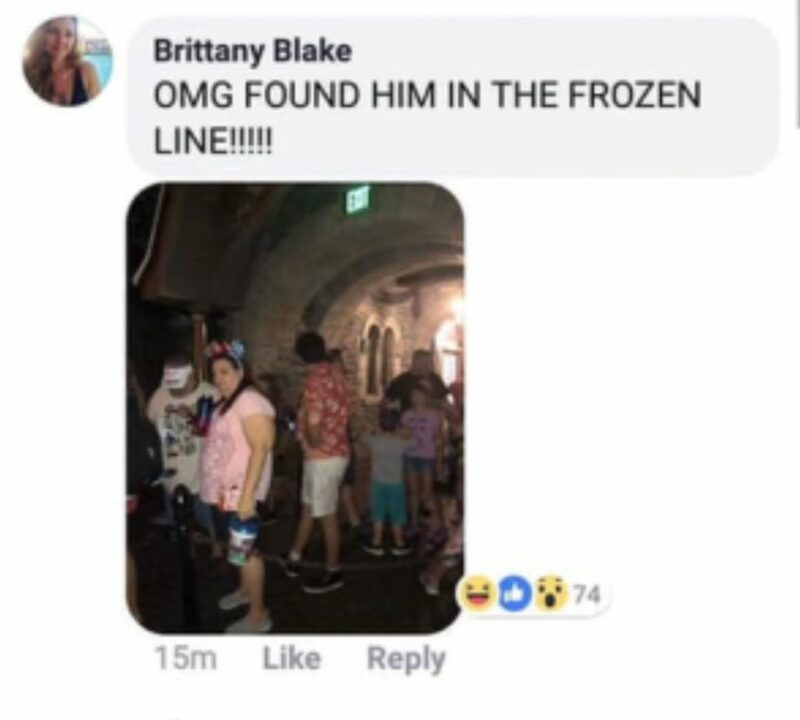 Others in the group, however, were fully enthralled in the tracking down of Turco, and right before the park’s closing Blake found Turco waiting in line for the Frozen ride. Blake made sure to let the waiting group know that she had finally found her missing boyfriend. “Update on my boyfriend: Found on the frozen ride. He was drinking all day while looking for me,” Blake said in the post. Neither Blake nor Turco could have imagined the attention the post would receive from the media. Both have been contacted by media outlets, but have only done interviews for Komando.com, a Disney-related YouTube channel called The Dole Whip Guy, and were recently interviewed by Inside Edition via Skype, with their segment yet to air. “I really appreciate social media, I can’t believe this has gone viral,” Blake said.